Wellington Lodge care home in Cheetham Hill has been classed as Good in all five areas by regulator the Care Quality Commission (CQC). Staff at Anchor’s Wellington Lodge on Waterloo Road were celebrating this week after receiving the accolade. 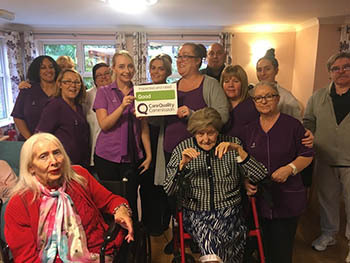 The home, which cares for up to 32 residents, was praised by the CQC in the recent inspection which took place on 28th September 2018. Care homes are now classed as either outstanding, good, requiring improvement or inadequate. Home Manager Leisa Millard said everyone at the home was thrilled because they had worked so hard to maintain high standards of care. She said: “We have worked hard to make Wellington Lodge a good care home but to be given such praise from the regulator is wonderful. We are proud of the meals which are made from fresh seasonal ingredients and the high levels of training and support our staff receive. The CQC inspection report, which can be found on the regulator’s website, highlighted the following examples of high standards of care at Wellington Lodge: One resident said, "They [staff] are always around when I need them, one had just gone to my room to get me something." Another person commented, "The food is lovely, they will make you something else if you don't fancy what's on." A resident advised, "The staff are lovely, they will do anything for you." For more information on Wellington Lodge care home, please call on 0800 085 4228.